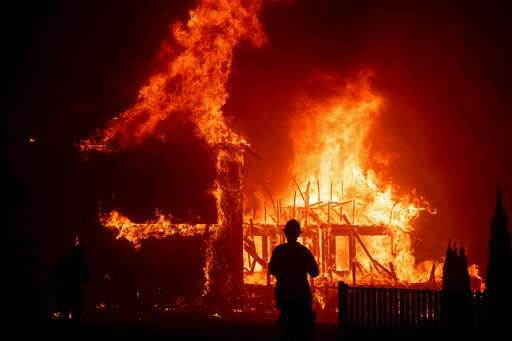 The so-called Camp Fire in Northern California in many ways has become the worst wildfire the history of a state whose topography and climate have long made it ripe for devastating blazes. With terrain ranging from steep, tree-topped mountains to dry, brush-covered hillsides, and matched with a climate that frequently varies from light rainy seasons to drought years, California has been home to deadly, destructive wildfires since record-keeping began in the early 20th century. Figuring out just how bad a wildfire is requires taking into account several statistics, including not only lives lost and homes destroyed but other buildings burned and the amount of forest, timberland and brush laid to waste. 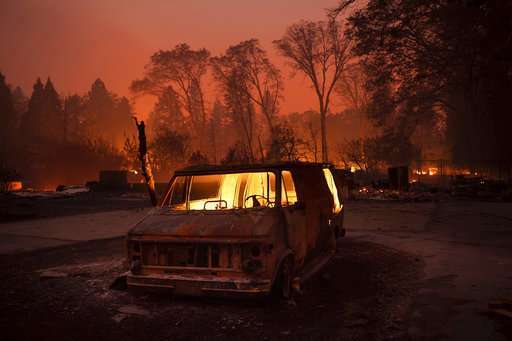 The Camp Fire, which destroyed the historical mining town of Paradise, is the most deadly in state history, with 84 fatalities as of Friday, according to statistics from the California Department of Forestry and Fire Protection. It's also the deadliest in the U.S. in a century. With hundreds of people still reported missing, the death count is likely to rise. The state's second-deadliest wildfire, Los Angeles' 1933 Griffith Park blaze, killed 29 people, most of them workers hired under a Depression-era Works Progress Administration program to widen roads and build trails in the sprawling wilderness park on the edge of downtown Los Angeles. Those workers had no experience fighting fires and no water readily available when flames erupted. They became trapped in a canyon when they tried to stop it with shovels and their feet by stomping on hot spots. The Tunnel Fire of 1991 killed 25 when it roared down the densely populated hillsides of Oakland, trapping people in homes and on narrow, winding streets. 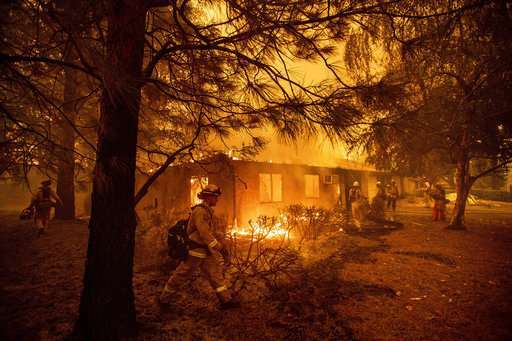 This third-deadliest wildfire began as a small blaze that firefighters thought they had contained, only to see it roar back to life when smoldering embers ignited other brush as fierce winds erupted. The Mendocino Complex Fire last year blackened more than 459,000 acres , or 717 square miles (1,857 square kilometers), much of it in the Mendocino National Forest, making it the largest in state history, state statistics say. That's nearly triple the size of the Camp Fire that has consumed more than 153,000 acres, or 240 square miles (620 square kilometers). But only one person died in the 2017 blaze. Last year's Thomas Fire, which scorched about 440 square miles (1,140 square kilometers) in Ventura and Santa Barbara counties, is the state's second largest. It killed two people. The Cedar Fire, which roared across about 427 square miles (1,106 square kilometers) in 2003, was the largest in state history at the time and is now the third largest. It is also the fifth deadliest. The blaze, which began in the Cleveland National Forest, killed a firefighter and 14 other people. Most were residents of a rural San Diego County canyon who didn't have time to outrun the wind-driven flames. Currently the Camp Fire is 16th on this list. This statistic is based on total structures destroyed, including homes, businesses and other buildings. The Camp Fire is far and away the leader with nearly 19,000 buildings lost, including 13,954 homes. Last year's Tubbs Fire, which burned through California wine country, is a distant second at 5,636 structures. 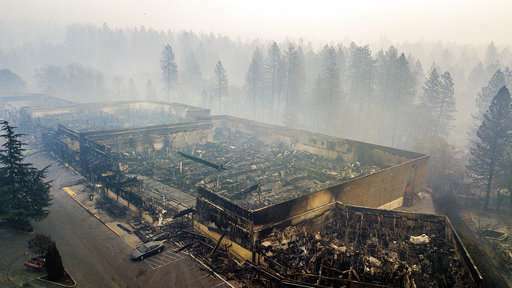 It's also the state's fourth-deadliest wildfire, having claimed 22 lives. The third deadliest, Oakland's Tunnel Fire, is also the third most destructive, claiming 2,900 buildings. ARE CALIFORNIA WILDFIRES GETTING WORSE? Statistically, it would appear so. Fifteen of the 20 most destructive California wildfires have occurred in the past 20 years. During that same period, 10 of the state's 20 deadliest wildfires have broken out, including four in just the past two years. Sixteen of the state's 20 largest wildfires have erupted since 1998. I've lived in Northern California two years this month and I've spent a total of six weeks indoors due to smoke. When we get a big fire it impacts half the state. The indirect economic effects were dramatic with the Camp Fire, and we'll never know how many elderly and ill people succumbed to the smoke effects.